Vandna brings a wealth of experience to her role as Director of Healthwatch Leicestershire. Throughout her 25-year career she has worked within roles that have a purpose to improve the lives and opportunities of disadvantaged communities. Vandna started off as a community outreach worker at Coventry Law Centre and went on to become Senior Welfare Rights Worker at Leicester City Council. She became Deputy Director of Voluntary Action Leicester in 1988 and then moved to the National Lottery Community Fund as UK Policy and Development Manager. Vandna then went on to Futurebuilders as Learning and Development Manager. In 2007 she was appointed as the first Director of Voice4Change England, a national organisation that champions the voice of BME voluntary and community sector. In 2012 she became Programme Manager for Voluntary Action LeicesterShire and in 2013 Vandna was appointed Director of Healthwatch Leicestershire. 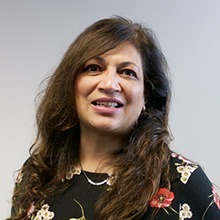 In her current role Vandna provides strategic support, leadership and management to ensure that Healthwatch Leicestershire is an effective voice for patients and public across the county.